Seems like the night time is the right time to get things done. After supper I made the walk up hill to the shop for some Friday night pottery fun. The afternoon was spent with visitors, bisqueware shuffling, and cleaning up. 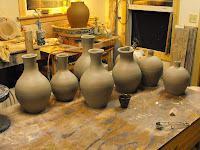 I wanted to make pitchers but ended up working on some vases/bottles. I've wanted to make these for a long time and struggled getting the technique figured out. After several that ended up in the bin, I got a few that I kept. The first ones were made by adding a coil to the top and throwing that into a neck, but it was hard to figure the proportions, (mostly my coil and throwing technique sucked!) The neck would kink and get off center from uneven coiling, etc. So what I decided to do was use the capping technique and threw the neck separately and that seemed to be a much easier approach. It's been a long time since I made of these forms, (probably early nineties)and I'm looking forward to playing around with the handles. Maybe they don't need handles? Your suggestions are welcome.